Surya Hospitals have been a pioneer in offering modern healthcare services for Women & Children in India since 1985. Over the last three decades we have regularly embraced the latest advancements in medical science and introduced cutting-edge medical technology to offer ‘best-in-class’ clinical outcomes and patient experiences. Patients have shown a relentless faith in our services and that has given us the confidence to grow from a modest 22 bedded paediatric nursing home in Mumbai more than three decades ago to a chain of multiple hospitals offering standardised care to women and children in the country. We are further expanding our footprint and setting up facilities which will offer similar services to patients in Jaipur, Thane and Delhi. This makes us one of the fastest growing single speciality hospital chain in Asia. With a view to spread the knowledge and clinical experience we run various academic courses in Paediatrics, Gynaecology and Obstetrics. We are one of the largest institutes running such government approved academic courses in Western India. You can find more information on this in the Academics section. 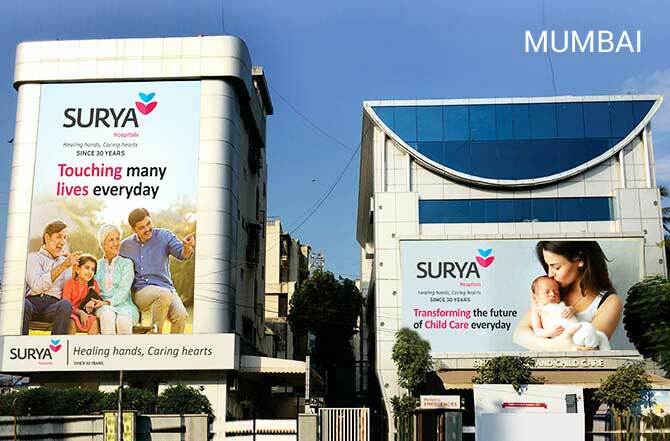 While Surya Hospitals makes rapid progress in widening our reach, we are simultaneously committed and focused on further elevating our patient experience to greater levels of satisfaction, and increasing our services by introducing more super-specialty services that makes us a leading name in neonatal & paediatric care, and the best in class women care facilities. Some of the ‘state-of-the-art’ facilities include – India’s largest level 3 NICU facility, dedicated neonatal ambulances for free transport of neonates, fertility treatment for women, specialty services in gynaecology, Gynec-oncology, high risk Obstetrics, in-house foetal medicine centre and experts, in-utero transfer facility, state-of-the art operating rooms and private suites, experts for OPD consultations, research and education for new and innovative health treatments.